I dozed off on the couch tonight. No surprise there. 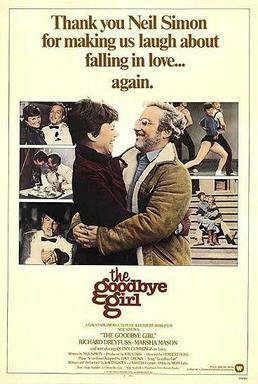 But I woke up as the movie The Goodbye Girl was starting. I snapped awake with memories of the first time I saw this film. It’s a great, great picture. I watched the whole thing. I saw this movie shortly after it came out in 1977. I was just a kid, really. I went to see it while visiting my sister who was away at college at the time. It should have been too grown up for me, but I loved this movie. It is the quintessential romantic comedy – in my book. This has to be one of the best examples of Neil Simon’s mastery of writing dialog. Loved it. Now the movie is over and I’m left to think about all of my experiences since I was that kid way back in 1977. Holy cow….that was 36 years ago!! Well, I’m still a kid, really, but all the wiser, now. Previous Previous post: Holy schmolies! Next Next post: Pasta night.